All the performances of human art, at which we look with praise or wonder, are instances of the resistless force of perseverance; it is by this that the quarry becomes a pyramid, and that distant countries are united with canals. Throughout Lent this year, I have been blogging each morning with daily reflections on thoughts from the great 18th century writer, Samuel Johnson (1709-1784), who is one of the great literary figures in the English language and who is often regarded as an Anglican saint. 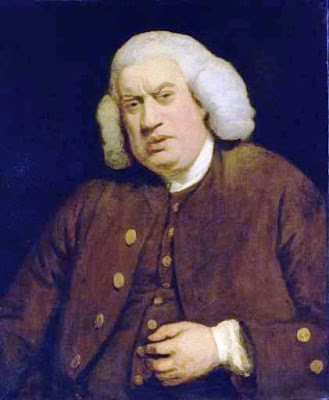 Samuel Johnson is commemorated on 13 December in the calendar of Common Worship in the Church of England as “Samuel Johnson, Moralist,” and in the Calendar of the Episcopal Church. He is best known as a writer of dictionaries and a literary editor. Apart from his connections with Lichfield – where he was born and where I have both lived and worked – I suppose I also like him because he too began his career as a journalist, working on ‘Grub Street’ – a term for hack journalism that he immortalised in his Dictionary. Yet in his lifetime he was renowned for his religious beliefs and as a firm supporter of the traditions of the Church of England. He had been deeply influenced as young man by reading William Law’s A Serious Call to a Devout and Holy Life and the writings of the Caroline divine, Jeremy Taylor. For the rest of his life, Johnson was unstinting in his support of the High Church party. Johnson’s essays entitled ‘The Rambler,’ which were published twice-weekly between 1750 and 1752, earned him the nickname ‘The Great Moralist,’ then a term of affection and honour. Although he began his literary career as a ‘Grub Street’ journalist, he made lasting contributions to English literature as a poet, essayist, moralist, novelist, literary critic, biographer, editor and lexicographer. Throughout his life he was a devout Anglican, and while he was a failed teacher who never completed his degree at Oxford, this important literary figure is known and loved universally as Doctor Johnson because of the honorary doctorate he received from Trinity College Dublin, where I am an adjunct assistant professor. Samuel Johnson was born within sight of the three spires of Lichfield Cathedral on 18 September 1709 in the family home above his father’s bookshop in Breadmarket Street, Lichfield – a house on the corner of the Market Square, opposite Saint Mary’s, the guild and civic parish church. A number of Reformation martyrs had been burned at the stake the Market Square in front of the Johnson family home. Because his mother Sarah was 40 at the time of his birth, George Hector, a “man-midwife” and surgeon, was brought in to help with the birth. The family feared the baby might die and the Vicar of Saint Mary’s was called in hurriedly to baptise him at home. The sickly child later contracted scrofula, known then as the “King’s Evil” because it was thought only the touch of royalty could cure it, and he received the “royal touch” from Queen Anne in 1712. His education began at the age of three, when his mother taught him to memorise and recite passages from The Book of Common Prayer. At the age of four, he was sent to a nearby school in Dam Street run by Dame Anne Oliver, and at seven he was sent to Lichfield Grammar School (now King Edward VI School), where he excelled in Latin and was promoted to the upper school at the age of nine. At 16, Johnson spent six months with his cousins, the Ford family, in Pedmore, Worcestershire, where Cornelius Ford tutored Johnson in the classics. When Samuel returned to Lichfield, an angry headmaster refused to allow him to continue at the grammar school. Later, Johnson began working for his father, stitching and binding books. This work gave him time to read widely and to deepen his literary knowledge. In October 1728, at the age of 19, Johnson entered Pembroke College, Oxford. Two months later, as a Christmas exercise, he was asked by his tutor to produce a translation of a Latin poem Messiah by Alexander Pope (1688-1744). This was 13 years before Handel composed his Messiah in 1741, and 14 years before its first performance, in Dublin in 1742. So Pope and Johnson were original in their choice of a title for this work. Although Johnson thought that prayer was too high and holy for poetry, he completed half of his translation of Messiah in one afternoon and the rest the following morning. The poem was finished quickly because Johnson was hoping for patronage that would help him overcome the financial difficulties he was suffering as an undergraduate at Pembroke. After he finished the poem, it was sent to his home in Lichfield, where his father Michael Johnson, a bookseller, immediately printed the work. Michael had already published the translation before his son ever sent a copy to Pope, and it is said Samuel become “very angry” and said “if it had not been his Father [who had done this] he would have cut his throat.” However, according to one of Johnson’s early biographers, Sir John Hawkins, Pope praised the work when he claimed that he could not tell if it was “the original” or not. But, while the poem brought praise to Johnson, it never brought him the material benefit he hoped for. Poverty brought about by his father’s failing business meant Johnson could not pay his fees. After 13 months, he left Oxford without a degree and returned to Lichfield, leaving behind many books he had borrowed from his father but could not afford to transport home. The poem later appeared in a Miscellany of Poems (1731), edited by John Husbands, a Pembroke tutor, and this is the earliest surviving publication of any of Johnson’s writings. Meanwhile, after his failure to get a job as a teacher at Stourbridge Grammar School and an unhappy experience at a school in Market Bosworth, Samuel Johnson returned home to Lichfield once again in 1732. While he was still hoping to get work as a teacher, he started writing for the Birmingham Journal, and after proposing a translation of Jeronimo Lobo’s account of the Abyssinians, he went on to publish A Voyage to Abyssinia. 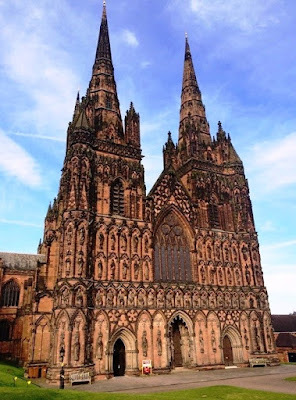 Back in Lichfield in 1734, he befriended Elizabeth (“Tetty”) Jervis Porter, a 45-year-old widow and mother of three who was 21 years older than him. Despite opposition from her family, they were married in Derby in 1735 – he was then 25 and she was 46. In the following autumn, Johnson opened Edial Hall School as a private academy near Lichfield. He had only three pupils – including the 18-year-old David Garrick, who later became one of the most famous actors of his day. But the school was a failure, costing Tetty a substantial portion of her fortune. In his first major literary work, the poem London, published anonymously in May 1738, Johnson portrays London as a place of crime, corruption, and neglect of the poor. Other early works in London included the biography The Life of Richard Savage and the poem The Vanity of Human Wishes, which TS Eliot regarded as one of the greatest poems in the English language. Johnson still hoped to work as a teacher, but all efforts to secure a post in grammar schools were rejected because he did not have an MA from Oxford or Cambridge. Alexander Pope persuaded Lord Gower to petition Oxford for an honorary degree for him, but was told that it was “too much to be asked.” Gower then asked a friend of Jonathan Swift, Dean of Saint Patrick’s Cathedral, Dublin, to have an MA awarded by Trinity College Dublin in the hope that this could be used to gain an MA from Oxford. However, Dean Swift also refused to act on Johnson’s behalf. Feeling guilty about living on Tetty’s money, Johnson stopped living with her. Instead, he stayed in taverns or slept in “night-cellars,” and on some nights he was seen roaming the streets of London. Johnson’s fortunes took a dramatic turn in 1746 when a publisher commissioned him to compile a dictionary of the English language – a contract that was worth 1,500 guineas. Johnson claimed he could finish the project in three years. In comparison, the Académie Française had 40 scholars who would spend 40 years completing its French dictionary. Eventually, he took nine years to complete his Dictionary of the English Language. Johnson’s Dictionary was not the first, nor was it unique. But it remained the standard, definitive and pre-eminent English dictionary for 150 years, until the Oxford English Dictionary was published in 1928. His Dictionary offers insights into the 18th century, providing “a faithful record of the language people used.” It has been described as “one of the greatest single achievements of scholarship.” As a work of literature, it has had a far-reaching impact on modern English. The first edition of Johnson’s Dictionary is a huge book. The pages are almost 18 inches tall, and the book is 20 inches wide when opened. It contains 42,773 entries, and sold for £4 10s, the equivalent of about £350 today. An important innovation was his use of around 114,000 literary quotations to illustrate meanings. The authors most frequently cited include Shakespeare, Milton and Dryden. Johnson’s Dictionary stands alongside the collected works of Chaucer and Shakespeare, the King James Version of the Bible and The Book of Common Prayer as one of the works that shaped and formed the words we write and speak to this day. As his Dictionary was going to publication, Johnson eventually received the degree he had long desired – Oxford University made him a Master of Arts in 1755. Meanwhile, Tetty Johnson, who had been ill for most of her time in London, decided to return to the countryside while he was busy working on his Dictionary and she died on 17 March 1752. Johnson blamed himself for her death, and seems never to have forgiven himself. Besides working on the Dictionary, Johnson also wrote essays, sermons, and poems during these nine years. His widely-read novel Rasselas (1759) is a “little story book,” as he described it, telling the life of Prince Rasselas and his sister Nekayah, who are kept in a place called the Happy Valley in the land of Abyssinia. Rasselas was written in a week to pay for his mother’s funeral and to settle her debts. It was so popular that a new edition was published almost every year, and it was soon translated into 14 other languages. In 1763, Johnson befriended James Boswell, who later became his biographer. Together they travelled to Scotland, and Johnson recorded their experiences in A Journey to the Western Islands of Scotland. Johnson’s long-awaited edition of Shakespeare was published in eight volumes in 1765. Towards the end of his life, he produced his influential Lives of the Most Eminent English Poets. Eventually, despite Swift’s refusal, Trinity College Dublin awarded Johnson an honorary doctorate (LL.D.) in 1765. Later, in his Life of Samuel Johnson, Boswell referred so often to him as Dr Johnson that he has been known as Dr Johnson ever since. When he returned to Oxford, he was accompanied by Boswell and toured Pembroke College with the Master, the Revd Dr William Adams, who had once been his tutor. Shortly before his death, Johnson composed an inscription for a floor slab in the centre of the nave in Saint Michael’s Church, Lichfield, to commemorate his father, Michael Johnson (died 1731), his mother, Sarah Johnson (died 1759), and his brother, Nathaniel Johnson (died 1737), who were all buried in the church. The original stone was removed when Saint Michael’s was repaved in the late 1790s, but it was replaced with the same inscription in 1884 to mark the centenary of Samuel Johnson’s death. As he lay dying, Samuel Johnson’s final words were: “Iam Moriturus” (“I who am about to die”). He fell into a coma and died at 7 p.m. on 13 December 1784. He was buried in Westminster Abbey a week later. Johnson’s life and work are celebrated in a stained glass window in Southwark Cathedral, he has monuments in Westminster Abbey, Saint Paul’s Cathedral, London, and Lichfield Cathedral, and he is named in the calendar of the Church of England as a modern Anglican saint. (Revd Canon Professor) Patrick Comerford is Lecturer in Anglicanism, Liturgy and Church History, the Church of Ireland Theological Institute, and a Canon of Christ Church Cathedral, Dublin. This paper was first published in Koinonia, vol 9 no 30 (Lent/Easter 2016), pp 22-26.